The LEAP (Leadership Education for Asian Pacifics) 2013 Leadership Awards Gala will be held on Thursday, July 25, at the Omni Los Angeles Hotel, 251 S. Olive St., Los Angeles. VIP reception at 5 p.m.; silent auction 5:30 p.m.; general reception 6 p.m.; dinner from 7 to 9 p.m. Attire: Business. This gala dinner celebrates LEAP’s 31 years of “growing leaders” and the leadership and accomplishments of individuals and organizations that exemplify LEAP’s mission to achieve full participation and equality for Asian and Pacific Islanders through leadership, empowerment, and policy. Proceeds from the event are used to develop LEAP’s innovative leadership programs, cutting-edge public policy research, and nationwide community-building. • Joanne and Alan Kumamoto, principals of the Los Angeles-based Kumamoto Associates, have provided management, marketing and communications services to more than 100 nonprofit organizations, public agencies, and corporations. They are recipients of the coveted National Public Relations Society of America (PRSA) Award for creating a multiethnic outreach campaign on behalf of the National Marrow Donor Program for Asian Pacific Americans and Native Americans. In addition, their collaboration with the State Library Partnerships for Change led to the implementation of a statewide program that was adopted into the California State University Library School curriculum. Next November, they will be honored by the International Visitors Council of Los Angeles for their efforts as citizen diplomats. Together and as individuals, the Kumamotos generously lend their time and expertise to numerous boards and committees. 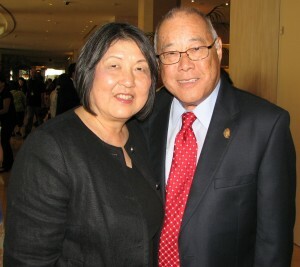 Alan helped develop the Center for Nonprofit Management, serving as its president and executive director, and assisted with the formation of the University of Southern California Asian Pacific Alumni Association. Joanne has worked extensively with new and emerging Asian and Pacific Islander communities and is a recipient of American Women for International Understanding’s 2012 Bernice Behrens Founders Award. Their many community affiliations include the Little Tokyo Community Council, CORO Foundation, Heart Mountain Wyoming Foundation, Los Angeles County Library Foundation, National Council for International Visitors, Fulfillment Fund, and Little Tokyo Business Association. • James Y. Ryu is the publisher of KoreAm and Audrey magazines. KoreAm began in April 1990 when he teamed up with his father, Jung, to launch an English-language monthly for the rapidly expanding Korean immigrant community in Los Angeles. Together, their mission for KoreAm was to have quality coverage of both cutting-edge issues affecting the struggling community and the noteworthy achievements of Korean descendants. In March 2003, James Ryu launched another magazine, Audrey, named after his daughter. This magazine is a celebrity-driven premium lifestyle magazine that focuses on the latest fashion, beauty, health, dining and home decor trends for Asian American women. With Audrey and KoreAm, he is planning to build a viable Asian American publishing house and continues to explore new projects. KoreAm, now based in Gardena, claims more than 50,000 readers and is the most widely circulated independent English-language publication focusing on Korean America. Ryu and KoreAm have won numerous awards, including: the Pioneer Award from the Korean American Coalition (KAC)-Washington and KAC-Orange County, journalism awards from New America Media, the PACE Setter Award from the Pacific Asian Consortium in Employment, a Community Service Award from the Korean American Bar Association-Los Angeles and KAC-San Francisco, a nomination for the GLAAD Media Award, and the APA Community Award from Assemblymember Ted Lieu. • The Sikh American Legal Defense and Education Fund (SALDEF) is the oldest Sikh American civil rights and educational organization. Founded as the Sikh Mediawatch and Resource Task Force (SMART) in 1996, it empowers Sikh Americans through advocacy, education and media relations. SALDEF’s mission is to protect the civil rights of Sikh Americans and ensure a fostering environment in the U.S. for future generations. SALDEFs vision is to create an America where Sikh Americans are recognized and respected as an integral part of American society; take a leadership role in shaping public policy and strengthening civil rights for all Americans; and are represented at the highest levels of government and in the media. The organization’s national office is located in Washington, D.C.
• O. Fahina Tavake-Pasi has been the executive director of the National Tongan American Society since November 2003. Her leadership took NTAS from an all-volunteer nonprofit, running an annual festival for nine years, to an organization impacting thousands of Pacific Islanders (PIs) residing in Utah. Under her leadership, an efficient staff and hundreds of volunteers successfully implement programs that include health education and programs, benefits enrollment, community wellness coaches, a weekly bilingual radio show, immigration assistance, scholarships, and translation and cultural promotion programs. Her main interest centers around decreasing health disparities within the PI community. Currently, Tavake-Pasi co-chairs the Regional Health Equity Council (RHEC VIII), serves as secretary for the international Tongan Research Association, and sits on Utah’s Governor’s MLK Commission. She has partnered with Utah Department of Health and University of Utah to successfully implement several PI-specific research projects. In addition, she represents the PI community on a rare community-campus-partnership called the Community Faces of Utah, which impacts five of the state’s underserved ethnic groups. Among her honors are the Governor’s Women’s Achievement of the Year Award and the Leadership Award from Salt Lake Community Action Program. In December 2012, NTAS received the Organization of the Year Award from OCA-Utah.